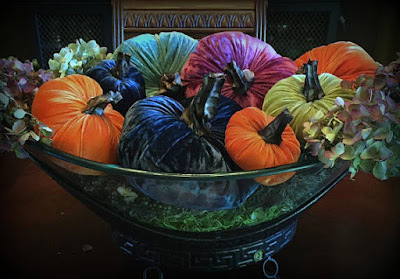 With autumn now here, it’s time to think about entertaining, and creating a warm welcome for your guests in the fall and winter months. Will you be hosting any holiday gatherings? Dinner party plans on the horizon? How about birthday or anniversary celebrations? No matter the occasion, the artisans of HandmadeMN have created an amazing array of handcrafted items that will enhance any gathering. Quilted placemats from HartfordAvenueQuilts will add color and warmth to your dining room table. They are sure to be a conversation starter, and will help you create a relaxed and cheerful feeling with your table scape. Geometry meets coziness: Quilt-inspired placemats. Aprons are a practical item, allowing you to stay neat and tidy while preparing for your guests. Why not choose a café style apron with enough style and panache to proudly hang in the kitchen? Try this linen fabric beauty from LakeshoreLinen. 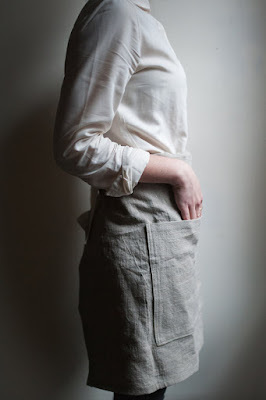 Stay fashionably neat with an elegantly simple apron. 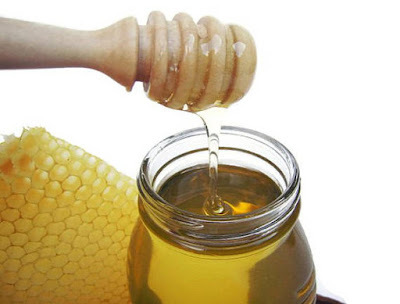 Honey is a natural sweetener, adding a subtly rich flavor to breads, desserts, tea and many other foods. Your guests are sure to appreciate this pure honey from SweetBeeHoney. Pass a jar around the table and let your guests enjoy this special Minnesota treat at your next gathering. Even the most discerning guests will appreciate the joys of local honey. 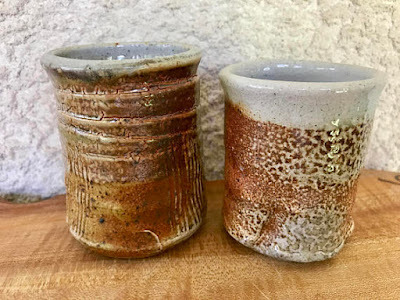 This pair of pottery cups from DianeGamm will be a handsome addition to your dining room table. In fact, their handcrafted beauty is worthy of display all year long. In addition to being wonderful drinking glasses, you can fill them with small bouquets of flowers for an additional seasonal decorating option. One-of-a-kind drinking cups will add earthy, organic flair to your table. Napkins in striking patterns allow you to add special-occasion flair to the dining room table with ease. 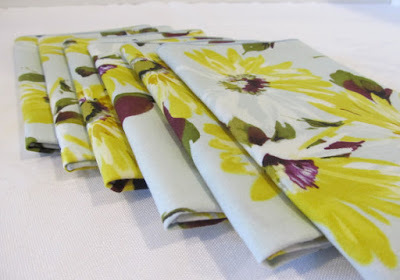 This patterned set of napkins from SnipsAndStitches will add sophistication and a pop of color to your next dinner party. Napkins in a sophisticated, joyful print; reminiscent of 1940's and 1950's textiles. As you can see, HandmadeMN makers have been hard at work creating a large assortment of thoughtfully handcrafted items for your home. 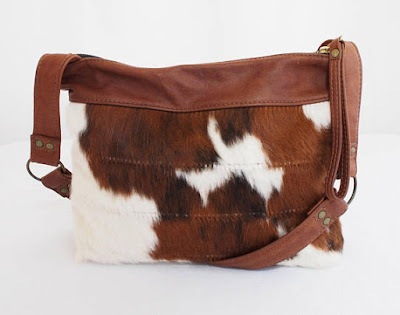 Take some time to peruse their many beautiful and practical offerings. You’re sure to find many items you’ll be proud to put to use during this season of entertaining. 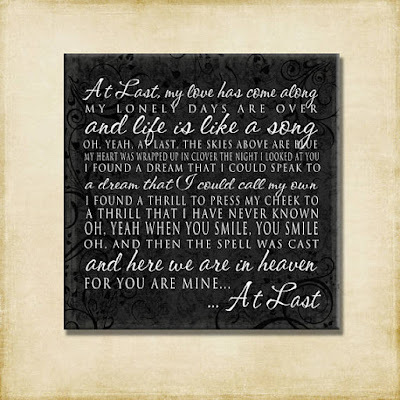 Ever wonder what an Esty shop owner does each day. Well here is my story. 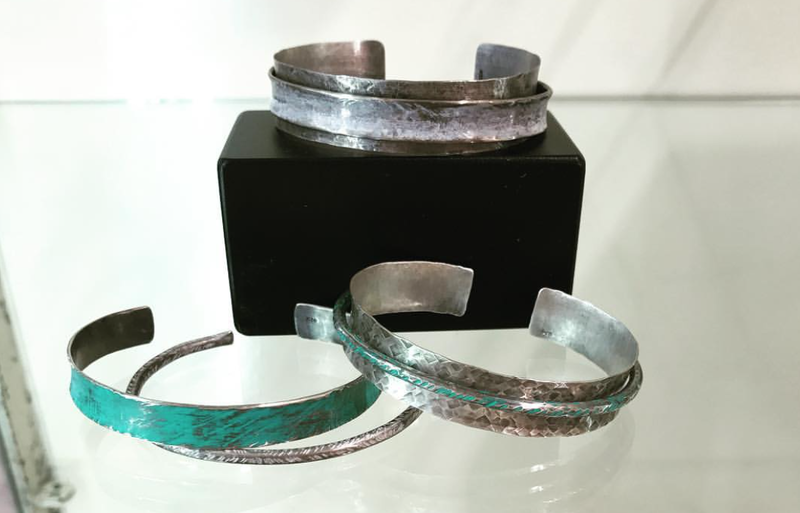 To introduce myself, I make handmade metal jewelry in a rustic style with lots of textures and dimension. I really enjoy taking flat metal and forging it into fluid shapes for jewelry. I have an online shop and my jewelry is in several retail shops in Minneapolis and across the country. 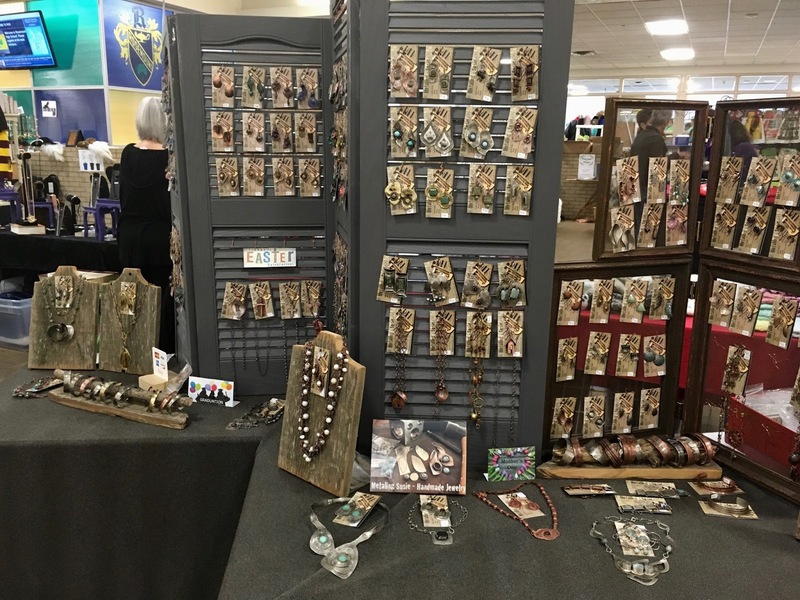 I also attend local Art Fairs which are really fun to meet the shoppers and see what they are drawn to in my jewelry. When I think about a typical day in my shop I find that each is quite different. Depending on my mood, the weather and day of the week, I seem to be doing something different....really! In the morning, I first check on orders and package them up for delivery. I like to be prompt for my customers. I also like to spend quality time in the morning at my bench making jewelry. 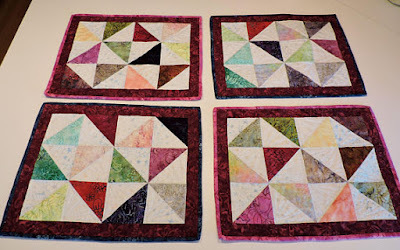 I have noticed that I always have several projects going at the same time. Sometimes this is due to a drying step but many times creativity just needs to marinate. I like to let pieces sit for a few days and come back with fresh eyes. I generally find new inspiration as I come back to finish a piece. The process to make my jewelry starts with cutting shapes from flat sheets of metal. Next, I texture the metal with design stamps or hammers. Sometime components need to be fabricated depending on the design. Layering metal and painting metal with ink are very fun steps in the process. I love to hammer on metal! It is amazing the dimensional results that happen! My standing bench with my tools and supplies close at hand. This afternoon, I happen to be walking to the New Gild Jewelers in Linden Hills, Mpls. I have some cuffs on display in this wonder gallery owned by Jen and Kelsey. 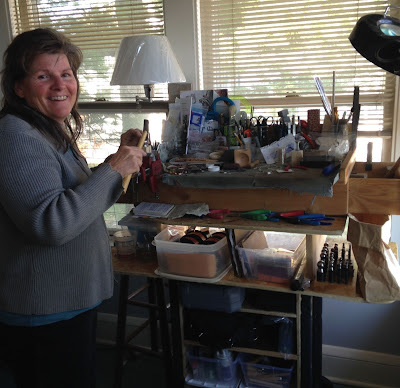 The gallery has several artists work on display and the owners make wonderful custom pieces. Many custom pieces are from family gemstones redesigned into beautiful jewelry. How wonderful! In the evening, I find myself spending a lot of time on my computer. I generally photograph my jewelry pieces in batches. I'll take shots on my iPhone and then transfer them to my computer. 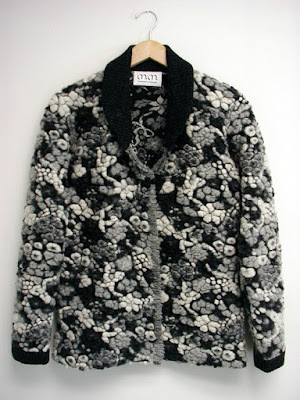 Once I sort through the best shots, I'll edit the photos and create new listings for my online shop. I also spend the evening time ordering supplies, managing business records and working on social media efforts. It's not as though there are more leaves in fall than there were in summer, yet we are so much more aware of them now that they are drifting through the air and gathering underfoot crunchily. In summer, we notice — and appreciate — the shade and beautiful greenishness that leaves provide; in fall, we notice the leaves themselves. Am I right? And of course, artists are not immune to the leaves' charms, so we see them showing up as a recurring theme in a variety of lovely things created by Minnesota artists of the HandmadeMN team. They are the leitmotif of autumn, and of this post. Click on the images to view the complete item listing on Etsy, and on the highlighted artist or shop name to browse their other works. 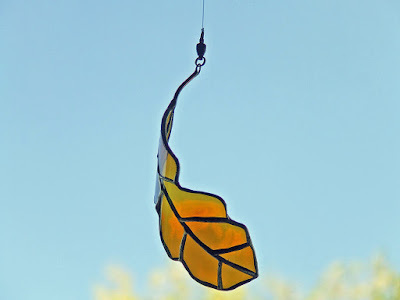 This oak leaf is just one of several leaf-themed sun catchers and mobiles from Western Art Glass. To get the curved shape, Brian Western cuts the leaves from the sides of glass bottles. 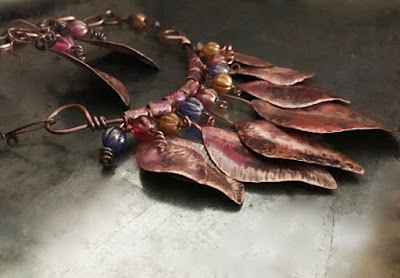 Metaling Susie has crafted this copper statement necklace and earring set in rich burnished autumn tones and tapered leaf shapes. 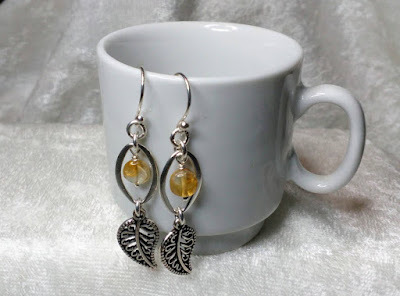 These sterling silver leaf earrings are accented with citrine for just a touch of autumn color, from Gemstone Talisman. 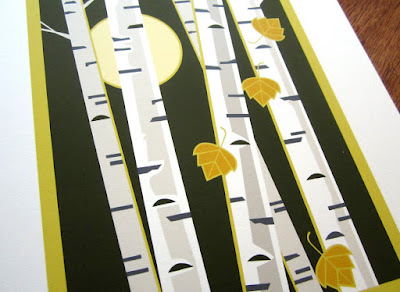 The picturesque white trunks and falling golden leaves of birch trees are captured on paper in the graphic Arts & Crafts style in this digital print by Cindy Lindgren. 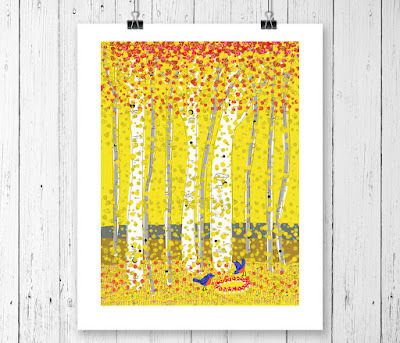 Another interpretation of birches in fall is offered by Lisa Ryden Erickson in this digital painting created on her iPad. Read about her process in the item description, it's rather interesting. 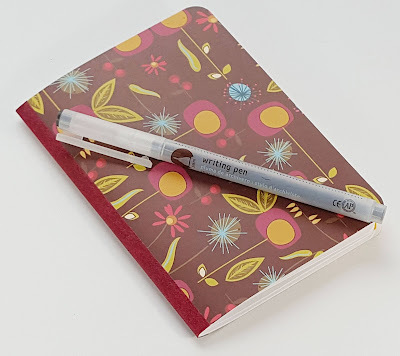 This notebook with touches of leaves and other botanical motifs in fall colors comes in a set of three notebooks, each with a different design on the cover. A practical item with a touch of artistry from Mendota Paper Company. 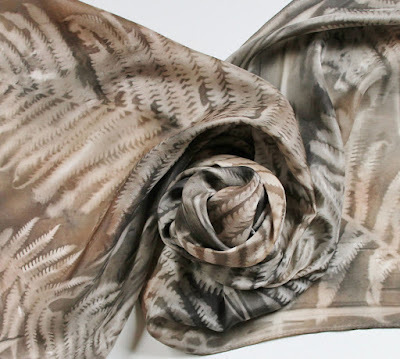 This hand-painted silk scarf by Palette Passion has sun-imprinted fern leaves rendered in the soft taupe shades that they take on in fall, as they curl and dry in the garden. 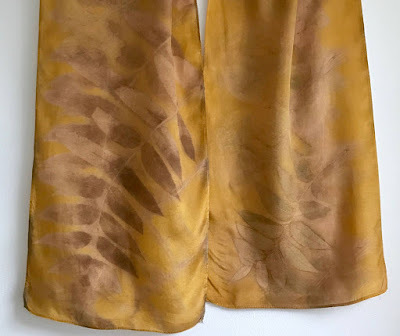 Here's another silk scarf by another HandmadeMN artist, Diane Gamm, in which she uses a different printing technique that she says transfers the plant pigment to the fiber. Read her item description for a brief description of this method. 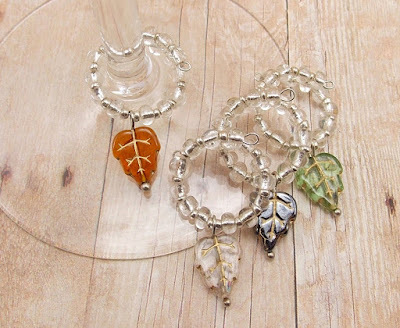 Wine glass charms, like this leaf-themed set by Deeder the Beader, are great for guests to keep track of which glass is theirs, and can be used on the handles of mugs, too, if you're serving coffee or hot mulled cider instead.